The only operational RAAF squadron to use the Lockheed Ventura in Australia and the SWPA was No 13 Squadron. (No 459 Squadron and No 464 Squadron operated RAF Venturas in the Middle East and U.K. respectively). Formed at Darwin on 1st June 1940 with Avro Ansons, No 13 Squadron re-equipped with Lockheed Hudsons the same month. In anticipation of hostilities with Japan, Hudsons were detached to Laha and Namlea in the Netherlands East Indies. After incurring heavy losses, the Squadron consolidated at Darwin from where reconnaissance flights and bombing missions continued. Enemy air raids on Darwin prompted a partial withdrawal south to Daly Waters in February 1942 and again to Hughes in May 1942. In April 1943, the squadron became non-operational and moved to Canberra to re-equip with Bristol Beauforts and Lockheed Venturas. Initially, the Squadron's Venturas comprised a mix of the USAAC B-34 and the USN PV-1. (The Squadron relinquished its last B-34 on 5 May 1944). During November and December, a detachment of Beauforts conducted maritime patrols from Coffs Harbour, NSW. With effect from 27 December 1943, the Beauforts were handed over to 2 Squadron and 3 Squadron detached three Venturas to Camden, NSW from where they continued maritime patrols off the east coast. On 8 June 1944, the Squadron's Venturas departed for Cooktown, Queensland. An advance party of eight aircraft departed Cooktown for Gove in the Northern Territory on 16 August 1944. From its new base at Gove, the Squadron conducted anti-submarine patrols and strikes into the Netherlands East Indies and Timor. On 12 June 1945, the S.S William H Seward sailed from Darwin with an advance party from 13 Squadron to a destination "believed to be Morotai". The ship duly arrived in Morotai on 26 June only to be quarantined because of a case of meningitis on board. It was not until 2 July that quarantined personnel were able to disembark! The majority of personnel who were not quarantined had proceeded to Labuan by 28 June leaving only a "skeleton staff" on board ship in Morotai. On 9 July, the remaining personnel sailed for Labuan on the liberty ship S.S. John H. Rossiter which arrived on 14 July. Setting up camp and maintenance facilities was "extremely heavy work" and the Squadron was forced to beg and borrow materials and equipment from other units. The camp was constructed using timber dunnage from the S.S. John H. Rossiter. The first six Venturas arrived in Labuan from Gove on 14 August commencing operations two days later. Initially the aircraft conducted patrols but by 28 August they were relegated to dropping propaganda leaflets! One week earlier, work had commenced to strip the Venturas of armament and radar, "evidently to prepare aircraft for transport purposes". On 4 September, North West Area Headquarters ordered that the ten Venturas remaining at Gove should proceed to Darwin to have their turrets removed prior returning Gove to uplift remaining personnel to Morotai. On 24 September, eleven Venturas arrived at Labuan via Morotai. As hostilities wound down, the Venturas were used to support Dakotas and Liberators in repatriating Australian service personnel. After the Japanese surrender, the Squadron evacuated prisoners of war to Australia and operated courier flights to Singapore, Japan and Australia. One Ventura (A59-76) was detached to the 1st Tactical Air Force in Tokyo. The Squadron disbanded at Labuan on the 11th January 1946 but reformed at Darwin in July 1989 as a non-flying reserve unit. From this point aircraft numbers are not reported, although motor vehicles are! Was SF-O in MAR45 & JUL45. To 2AD. NAA: RAAF Unit History sheets (Form A50) [Operations Record Book - Forms A50 and A51] Number 13 Squadron Jun 40 - Dec 45, Series number A9186. RAAF Historical Section, Units of the Royal Australian Air Force, Vol. 3 Bomber Units. 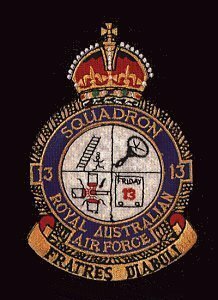 The 13 Squadron ORB (Source: 2) is remarkably detailed and usually identifies aircraft by serial number as well as listing dates that aircraft arrive and depart the Squadron. In the rare instances where this information is not recorded in the ORB, data has been drawn from the Status Cards (Source: 1). In instances where there are conflicting dates in both sources, the ORB has been given precedence. Where an accident is recorded in the Remarks column the Disposal date is the date of that accident. The column headed "Labuan" lists aircraft which are known to have been based at Labuan which was the Squadron's most forward base. Aircraft shown as TBC (A59-67, 86, 95 and 98) most probably were at Labuan but are not specifically mentioned in the ORB and are therefore subject to confirmation. 13 Squadron Venturas carried the Squadron code SF on the fuselage followed by a single letter (on the other side of the roundel) to denote individual aircraft. Where known, these codes are listed in the column headed SF. Note that some aircraft carried two or more different codes at various times.. Page completely updated from sources shown. Added code letter G for A59-69 thanks to Gordon Birkett. Added codes for A59-61, 62 & 99 and names for A59-56, 81 & 85. Thanks to Bob Livingstone. Many additional codes were added thanks to Phil Herdman. Also added A59-64 & 98 as 13 Sqn aircraft.